Cufflinks have the power to convey the personality or mood of the wearer. They can make a formal impression or a more casual, playful one, depending on their style and use of materials. From single, large diamonds connected by chains to basic gold-plated discs with brass connections, they are available in myriad manifestations, in every price range. jewellery manufacturer created the cufflink, as we know it today. George Krementz, a prominent Newark jeweller, patented a design that would not require the wearer to attach each terminal together by chain. Instead, the cufflink became one whole piece. He also applied this invention to collar buttons and shirt studs. Growing demand during the first part of the 20th century motivated manufacturers to improve fastening devices. The history of cufflinks corresponds to that of the button and buttonholes on men’s shirts. The French cuff was created in the mid-17th century and required fasteners. The cufflink, in its basic form, was introduced as a solution. 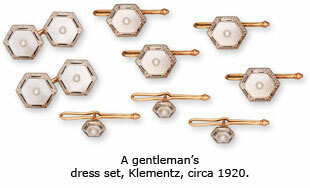 They were only worn by members of the aristocracy and were fittingly designed as elaborately jewelled buttons. By the end of the 17th century, cufflinks took over from the conventional ribbons and ties that were worn at the wrists of men’s shirtsleeves. the rising merchant class. As Queen Victoria ascended the throne, they became essential to men’s fashion. Cufflinks made in this era were often simply gold, silver or pearl terminals chained together by hollow linking. As the Industrial Revolution kicked off, electroplating was invented and brought jewellery to a wide sector of the population. The cufflink quickly became the most expressive‚Äìrather than the most expensive‚Äìof men’s fashions. Throughout the Second World War, the post-war period and into the early 1970s, extreme cufflink designs were created during this period. The designs with which a man chose to adorn his attire revealed much about his personality. Because of this inherent symbolism, cufflinks have maintained a stable and continuous popularity through centuries that is rarely seen among other types of jewellery. Despite the fickle fluctuations in fashion, a handsome pair of cufflinks, whether antique or modern, still denotes a well-dressed man. Top: Enamel and 18k gold cufflinks by David Webb, circa 1970; Art Deco onyx, diamond and platinum cufflinks, circa 1915; Antique enamel and diamond cufflinks, St. Petersburg, circa 1900.